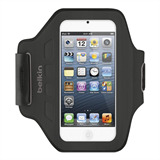 Runners, gym-goers, and other exercise enthusiasts can keep the music going with the Ease-Fit Armband. 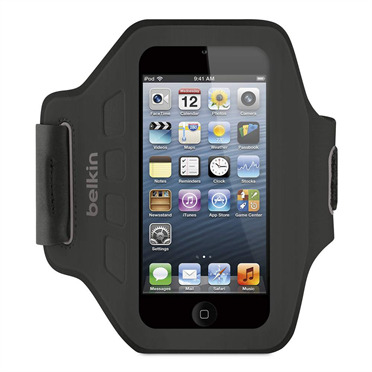 This band holds your fifth-generation iPod touch snugly against your arm, keeping your music player close without allowing distracting movement. This neoprene-Lycra armband is lightweight and flexible, and its clear window gives you full access to the touchscreen and Home button. This low-profile armband is hand-washable. Don't let your iPod touch get in the way of your workout. The sporty Ease-Fit Armband wraps snugly around your arm, ensuring your music player stays put. It has a overall length of 16.5” with a circumference range of 23 - 33cm and has a slim, form-fitting design that stays comfortably in place.